I suppose it is time to bite the bullet and (in)formally announce the Grand Plan that I am slowly working toward. This being the Grand Plan that as yet I have neither time nor space nor money for, but which will (I am determined) will one day be an actuality rather than an idea. I would like, therefore, if I may, to introduce you to Rufford Red Lion Square. Now how do I start to describe the elaborate thinking and influences and suchlike that have coalesced into such a layout name? At the beginning, I suppose. Some of you may have been kind enough these last few years to have read my blog describing my efforts to create a collection of locomotive and rolling stock models of various Great Central prototypes, with the odd Metropolitan machine thrown in. When I began that blog, about four years ago, my intention was to build a model of something Marylebone-esque, a middle-sized London terminus station with LNER and Metropolitan joint working. Well, what with having decided on an ex-GCR location I needed ex-GCR locos and stock, and the obvious source of information on same being books about the GCR I set about building up a little reference library. What of course happened then was that books and photographs started piling up and I found 'interesting' things that could be modelled, or rather that I have or had then yet to see be modelled. The first change was from an early 1930s period to a mid 1920s one, on the basis of photographs of engines with 'L&NER' on the tender and tank sides and the numbers below. So no sooner had some of my stock been put back to mid-1920s condition, it had to be backdated yet again. But when, exactly, would I like to model? I had a look at the models I had already built, bought or had to hand. There were examples of the three Bachmann GCR types- the J11 (introduced 1902), the ROD (introduced 1913) and the Improved Director (introduced 1920). I had a couple of N5 tanks (introduced 1891), a Jersey Lily (1906), an Immingham (1907), a Fish Engine (1904) and a pair of Directors (1913), and an L1 tank (1915). For rolling stock I had a set of Ratio suburban carriages, which to my eye are close enough to pass for arc roof Ashbury stock introduced around 1903, some Hornby clerestories, which can be made to look GC-esque as they are but for which I had grander plans, some Graham Farish OO suburban carriages (very close in appearance to later Robinson suburban stock), mainline carriages from the same stable (loosely based off of Maunsell stock, but again rather close to post-1910 Robinson mainline stock) and some Mainline/ Dapol/ Bachmann Mk.1 LMS stock (which looks vaguely Robinson-ish once the panelling has been sanded off and a matchboarded effect drawn or scratched on). Unless it was my desire to once more go back and start over again, the only period I could reasonably model with what I had to hand was from about 1920 to 1923, those awkward years between the privatations of the Great War and the Grouping. Hardly the pre-grouping scene in all its glory- but it has come to appeal to me on the 'I've not seen it modelled' front. So that is what I have been working toward. Besides, nice as it would have been to model the Great Central Railway in true Edwardian splendour, it has been done before- and I feel done better than I could hope to achieve. No sooner had the date been set to my satisfaction than I had a bout of wanderlust. My blog is entitled 'the GC and Met in OO' and that pretty plainly lays out my geographical area of interest. At least, it did, when I began the blog. I have, it is true, built a few Metropolitan engines- attempted an E class 0-4-4 and made a rather nice job of a Radleys MetroVick Bo-Bo- but as my library of GC books grew it opened my eyes to other areas served by the Company. Coming north out of London and following the 1897 mainline there are (were) a number of appealing stations that I might have chosen- but I didn't want a wayside through station that would be pretty to look at with little operational interest. It might form a nice focal point on a big roundy-roundy layout, but I've not the room for one of those and if I wanted to just watch the trains go by- well, I could achieve that with my old Hornby 'Flying Scotsman' and the dining room table. So they were considered and rejected. There have been layout suggestions in magazines for the larger London Extension stations, like Leicester (I think that was even what the plan was called!) but again those fell in combat against considerations of space. Also of course Leicester Central (or part of it) is the subject of a large club layout- and really something like that needs to be a club exercise to be done well- and so that too was considered and rejected. Fundamentally I wanted to model somewhere that might have been served by the GC, but wasn't. Something 'like' Denny's Buckingham Branch, but with a clear and unmistakeable identity of its own, geographically and chronologically set clean away from anyone or anywhere else... somewhere where I could create something unique. It was a poser of a problem, and it had me stumped. Two things then happened. I was toying around with trying to draw a trackplan, which I doodle occasionally just to pass the time, and I found the long pair of threads about Cyril Freezer's 'Minories' plan. 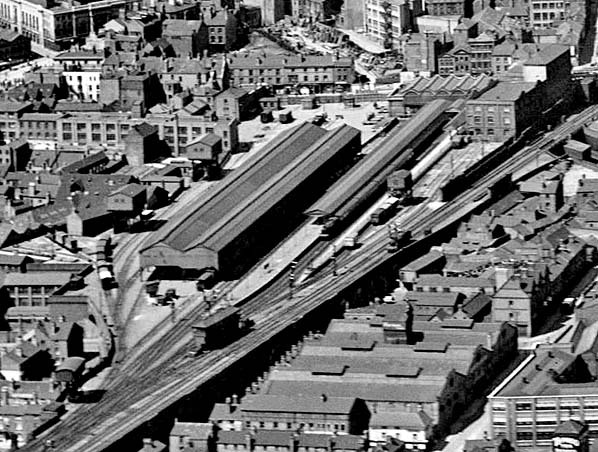 Somebody happened to mention how one end of Sheffield Victoria could be warped into something Minories-esque with greater operating potential. Cogs began to whir. Then I bought two Iain Rice books- Mainlines in Modest Spaces and Designs for Urban Layouts- with his take on parts of Norman Eagle's "Sherwood Section"- and things just clicked. A fictional Midland mainline running north from Nottingham- straight through the territory of the erstwhile Manchester, Sheffield and Lincolnshire Railway. How would the progenitors of the GCR have responded to such a line? How interesting. I have not looked at your blog, life is to short to follow blogs if I want modelling time as well, but I will follow this with interest. So is it Nottingham, or Sheffield or somewhere in between? My knowledge of the GCR is at the Met end and this thread. My only knowledge of the MSLR is making Silhouette files for 6 wheelers as through coaches for my layout. As least the GCR painted their coaches, I am going to have to paint mine mahogany! All the best, and will follow with interest. Thank you. I'm building some ex-MSLR six wheelers at the moment (I say, at the moment, I've built two and my planned next project is a third)- in my case I'm reusing some Ratio GWR 4-wheel coach bodies with Brassmasters chassis and new footboards/ running gear. Much as I would have liked to have finished them in French Grey or Cream and Chocolate, I've finished them in teak to suit my period. GCR teak is an interesting thing to model- it's so much more lively a colour than the LNER hue and is closer to the red/brown end of the spectrum. It's not quite mahogany, but it's not far off. How interesting. I will have to find your blog and see how you do it. I am just about to start the build of a six wheel composite, and I am drawing out a 6 wheel brake composite. It is not my cutter so I cannot offer to cut some for you. The brassmasters chassis is what I had planned to use but I need to get on top of soldering first. And so, to begin the backstory. At this juncture I should really point out that I don't have particualarly great knowledge of Norman Eagle's "Sherwood Section". Aside from it being to 7mm coarse scale, with a decided emphasis on running to a strict timetable using spring mechanisms, the only other information I have found is that in Iain Rice's trackplan books. The Sherwood Section runs north from Nottingham, through Rufford (where a light railway from Lincoln joins it), to a seaport on the confluence of the Trent and Humber. Iain Rice's Rufford Market Place trackplan suggests a large station serving a town of some importance- maybe not quite a city- and I began to wonder, how would the Great Central have set out to serve such a settlement? The first stage to setting the backstory was to see if there already was one! There was little information on the Internet about the Sherwood Section, and I couldn't find any articles in old magazines about it either, from which I concluded that in setting the Sherwood Section, Eagles had decided where his layout was set and what the traffic would be, and gone no further. I say this is my conclusion; I could be quite wrong and if I am- well I would like to be pointed in the direction of the information. It's the sort of thing I find interesting. Rufford Abbey is a country estate in Rufford, Nottinghamshire, England, some 2 miles (4 km) south of Ollerton. Originally a Cistercian abbey, it was converted to a country house in the 16th century after the Dissolution of the Monasteries. Part of the house was demolished in the 20th century, but the remains, standing in 150 acres of park and woodland, are open to the public as Rufford Country Park. Part of the park is a Local Nature Reserve. The abbey itself was founded by Gilbert de Gant, on 12 July 1147,and populated with Cistercian monks from Rievaulx Abbey in Yorkshire. The English Pope, Adrian IV gave the blessing for the abbey in 1156, following which the abbey's lands expanded and the villagers of Cratley, Grimston and Rufford, Inkersall were evicted. So here's the beginning (the very beginning) of a backstory then; what if those villages had not been abandoned on the whims of the Church? Plainly in the Sherwood Universe, Rufford had gone on between 1156 and the nineteenth century to become the principle village of the area and then a large town. So I had a reason for the Great Central to go there; but how to deal with the presence of the LDECR and the Mansfield? Well, the LDEC was only built in the 1890s and the Mansfield later still than that- if I could get the GC there before 1895, well that becomes a problem for them and not for me. So, to the backstory. The fiction appears in red. By the mid-1840s, the Manchester, Ashton-under-Lyme and Sheffield Railway had built what would later become known as the Woodhead route. At the Sheffield end, connection was made with the Sheffield and Lincolnshire Junction Railway, and with the Great Grimsby and Sheffield Junction Railway also brought into the arrangement, a continuous railway ran from Manchester right through to Grimsby across the Pennines. A line diverged from the Grimsby line and ran through Market Rasen to the Midland Railway's station in Lincoln, which had opened in 1844. The whole came into operation in around 1848/49. 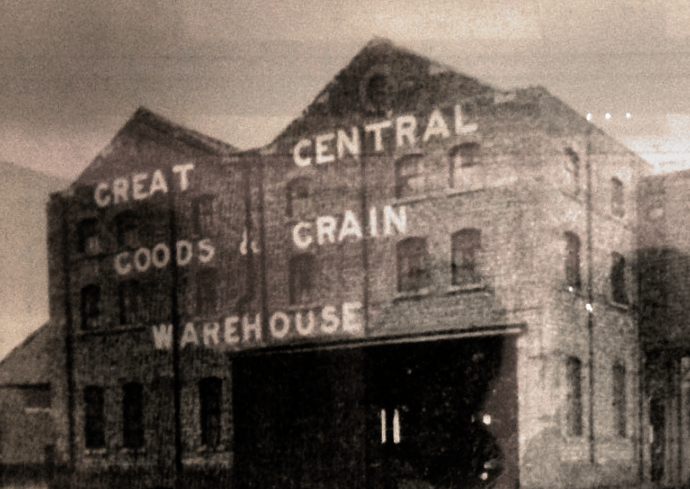 Let us say then that the Nottingham to Lincoln line (opened 1844) was a part of a larger scheme connecting Port Trent (Sherwood Universe), Nottingham and Lincoln. In 1844 Rufford has a station on a north-south railway with connections to the east. However, Rufford is closer to Sheffield than Lincoln, and has more trade to the west than the east. In 1844 the Lincolnshire lines of the MSLR are seeking parliamentary approval (as-per our timeline they go to the north of Rufford and will be approved) and the merchant class of Rufford, feeling rather snubbed that they are presently denied rail connection to the west, form their own company to build a railway to connect with Sheffield. This rather alarms the Sheffield and Lincolnshire Junction- railway schemes being taken through Parliament in batches and proposals that serve the same areas being weighed against each other and the weaker thrown out- it appears to the S&LJR that if the Sheffield & Rufford is passed, then their own Lincoln and Grimsby/ New Holland line will be thrown out- so they come to an arrangement. The SL&JR and Sheffield & Rufford are merged- 3 directors of the Sheffield & Rufford are taken onto the SL&JR board- and the SL&JR Act is passed for a line from Sheffield to New Holland with a branches to Lincoln and Rufford. The Rufford Line will commence at Beighton Junction- the point to the east of Sheffield where the MSLR meets the Derby- Leeds line of the Midland Railway- and run through Killamarsh and Mansfield to Rufford. Running through fairly level country with no major civil engineering works of note, it opens in 1848 and until the Market Rasen line is opened the following year Lincoln traffic runs via Rufford, onto the Sherwood Section and then via Nottingham to Lincoln. Rufford Red Lion Square is a terminus station, but just outside of Rufford is a spur between the MSLR line and the Midland route. This spur is officially closed to passenger traffic in 1850 but is retained for through freight traffic. In the 1890s the MSLR commence construction firstly of their Derbyshire and Nottinghamshire lines to Chesterfield and Annesley, and then of the London Extension. As part of these works Beighton Junction is reconfigured, to the west to Sheffield and Manchester, to the north east to Lincoln and Grimsby, to the south east to Rufford, and to the south toward Nottingham. The Rufford element is relaid as a triangular junction to permit trains from Rufford to run straight through either toward Sheffield or toward Nottingham. As an important town about to gain through services to London, the town elders petition the MSLR for a new station, which is rebuilt as a part of the London Extension on its original site. 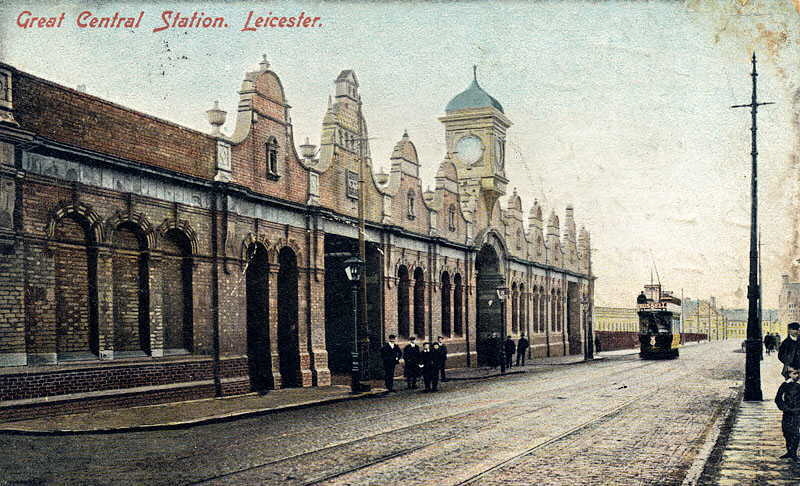 The new station is completed in 1902 and in 1903 Rufford- Marylebone direct services commence, timetabled to connect with Manchester- Rufford expresses. By 1920, several Manchester- Marylebone expresses are using Rufford as a calling point to change engines; 4-4-0s and 4-4-2s take trains up to Marylebone whilst 4-6-0s take them down to Manchester. That's exactly how I started- two months ago (ish) my experience with soldering irons was exclusiely of the 'this is how you burn yourself with one' school- and my first proper attempt at the art was a Brassmaster's chassis. I've done two of them now and for a complete novice in soldering I thik they're a perfect starting point. The current trackplan, which I am quite happy with but again may well change before any wood is cut, took form last November after a visit to the Great Central Railway (Nottingham) at Ruddington. 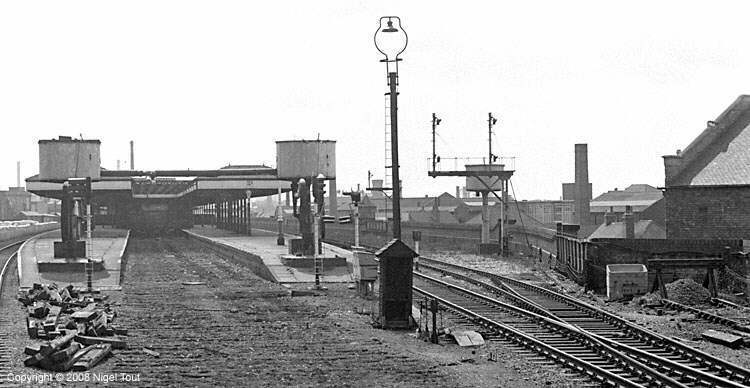 This was before the second platform at Ruddington Fields was completed, but I was quite taken by how the overall plan there appears to be two platform roads and a release road. There's also the potential for a bay road. Overall, on a fairly modest site, it could become quite an imposing station layout. So I began idly doodling and before long I came up with something similar that could be achieved in a length of around 10 feet. For freight traffic I decided to take a corner- just a corner- of the track layout of Marylebone goods depot (specifically the area around the goliath crane, between the electrical/ hydraulic powerplant and the goods warehouse). I've laid this out using Peco Streamline templates on SCARM. I'm intending to use the new bullhead track; so I have designed for using large points where possible. Some pointwork may well have to be in flatbottom!- it depends when I'm able to start construction and how quickly, if ever, Peco manage to get more of their point range in bullhead. Although it may appear that there are four platform roads, in fact there are only three. A bay road (at bottom) and two full length platforms either side of a release road. The full length road to the top, with the run-round loop, is intended as a goods line. I've not shown any buildings on the plan- yet- I have an idea how I want to set it out but whether that idea works or not has to wait until I have it all laid out in the flesh, so to speak, to make a decision. I've alluded previously that it's the townscape element that I find most interesting- locomotives and rolling stock aside- so the next few posts I'll start to describe for you all how I see the town of Rufford having developed. In our timeline of course Rufford and its neighbouring villages were abandoned, or rather evicted, in the mid-12th Century and today there is no sign that they were ever there... but what if that had not been the case? We needn't concern ouselves with why the village was located where it was, but we do need a reason why both the Midland and the Sheffield & Lincolnshire Junction felt compelled to build lines there. In my backstory I of course have a reason why the S&LJ did- to remove a competitor from the field when their Sheffield- Market Rasen- Lincoln line was fighting for Parliamentary approval- but that still leaves the Midand to explain away. Of course it lies on the route from Nottingham to Port Trent, but why specifically route that line through Rufford? Of course none of this needs to be modelled at all. Coal mines, marshalling yards, mile upon mile of railway sidings and all of the PO wagons that would fill them- they are going to be *near* the town, but by no means on top of it. So it's a mining town, it was the coal mines that provided the impetus for the railways to go there and it was the ability to take that coal away and sell it in vast quantities that made the coal owners a fortune in the mid-19th Century. Thus drawing in more colliers, thus the town grows..... thus my Rufford follows the path of various other industrial towns in the North and the Midlands through the Industrial Revolution. Without going into far more detail than is completely necessary, I can then say that Rufford goes through the same socio-political upheaveals as other burgeoning urban centres in the Victorian era- the Corporations Act, towns guilds, debating and mutual improvement societies, technical schools, museums and art galleries.... all the grand civic Victorian schemes. A good book to read for this sort of background information would be Tristram Hunt's "Building Jerusalem- The Rise and Fall of the Victorian City". In turn then this history of the development of the town dictates the architectural style(s) of the layout. I suppose there are two aspects to layout planning. The first, that we all do in idle moments, is to sit down with pencil and paper and doodle out track plans. That's the easy bit! The second is then to plan out the rest of the layout to go around it, which is or can be a bit more difficult... yes you might only need baseboards a foot wide for the permanent way, but then that doesn't leave much room for the scenery.... which is fine if you're going in for urban layouts but perhaps less so if you want the idea of open countryside. Of course, I've already settled that I'm going for an urban setting, but I've now got the problem of deciding what sort of urban setting.... is it going to be suburban, with row upon row of back to backs and terraced housing? Is it going to be semi-industrial? Or is it going to be city or town centre, with the big impressive municipal buildings? Each presents a bit of an issue. If it's suburban in setting, I should really be modelling a small through station rather than the terminus I have in mind. If it's semi-industrial, should there be a station at all? And if it is city centre, wouldn't the town elders kick up a fuss about there being something so undesireable as a goods yard so near to their ivory palaces? It's not nearly so simple as just plonking buildings around the station! Whilst I'm trying to circle the square in this regard, I've also been accruing a library of sorts of images showing what I would like to achieve. I've taken to calling these my lantern slides. I want a station that isn't a carbon copy of anything the Great Central actually built, but that could be taken for being one that might have been. My trackplan looks rather like the bay end of one of the larger GC stations!- I suppose any terminus would, really- so the first of my lantern slides is of the north bay of Leicester Central, circa the late 1960s. There's an obvious problem here- no track!- but just look at all the detail this photo catches. The particular detail I really like are the two watercranes and what looks like a water pipe linking the two. I'm not sure about the water pipe but the cranes themselves would be a prerequisite at Rufford, not only for local traffic but also for the long distance expresses that will be changing engines here. Look at that roof as well. I don't see Rufford as meriting an overall roof, but it certainly deserves better than a couple of mean little platform canopies. See how they completely cover the platforms but leave the tracks open to the elements. I find that rather an appealing idea. Having started at Leicester Central it is only natural that the next slide should also be of that station, save that this time we've left the train to look at the building. Well, I say the building, it's the porte cochere really. One of the aspects of late Victorian architecture that has always appealed to me is the polychromatic brickwork and the mix of brick and stone masonry, so this certainly must be something that I weave into Rufford. I'm not going to model this as-per the slide; as I have already said, I don't want a copy of anything the GC actually built- but as a pointer of what I should aim to achieve this is a pretty good example. Now what could the Birmingham & Midland Institute possibly have in common with the Great Central? Nothing, I grant you, but consider. 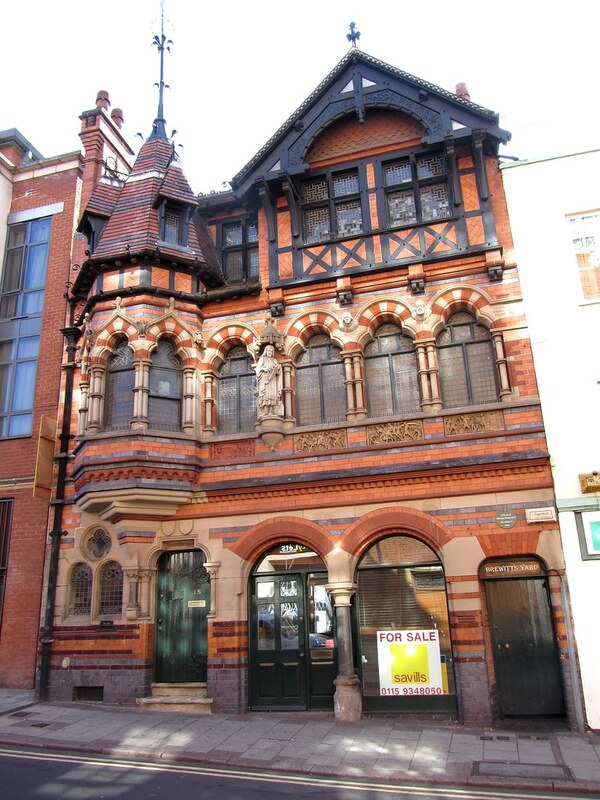 This is a building that dates from the 1890s and clearly adheres to the same architectural style as the London Extension stations, what with the Dutch gables and the wide chimneys and the liberal festooning of stone details in otherwise plain brick facades. I'm not saying this is the model for Red Lion Square station- indeed, I'm not at all sure you could take a library and lecture theatre and convert it, happily, into a railway station- but, much like the postcard of Leicester Central, it provides a good pointer of what I'm aiming for. 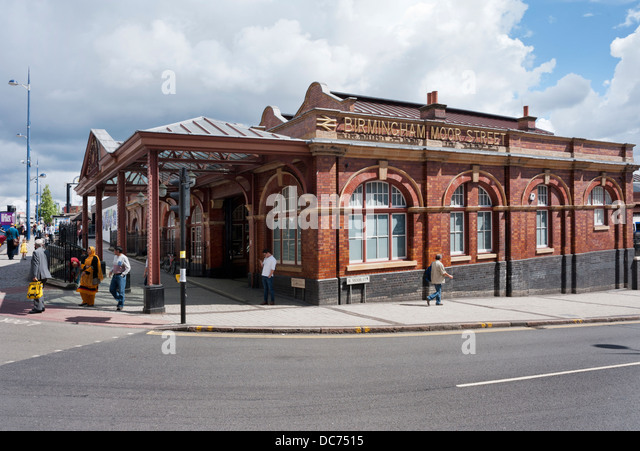 If someone were to pin me down and order me to name a real-world station that Red Lion Square is akin to, I would nominate Birmingham Moor Street. In terms of architectural style, size of the station, passenger and freight services and city centre location, it comes pretty close. It also had a rather neat means of maximising goods yard space on a limited site, but as yet I've not decided whether I'm going to follow suit. I have something a little grander in mind for the station buildings, too. I like your thinking. The institute could definitely work as a terminus building. Good luck with all the intricate detail. The question is, how big was the town when the railway arrived? If I remember rightly it was already growing so the railway had to either find space or build on the edge of town. It could be that that side of town only grew after the railway arrived so what grew up around it could be anything. I think perhaps it would be helpful if I were to try mapping out the town. This world-building business is a bit complex! The first step to building the world must be the topography really. Not only does it dictate the route of the railway, thinking back to my student days it was also impressed on us embryonic architects and town planners how the lay of the land influences the development of the urban landscape. I've been looking for a topographical map for quite some time with no luck, until a bit of idle googling this evening brought up exactly what I'm looking for. Ah. Hmm. I think I might need to go back and reconsider the route of the line; I didn't realise there was a 6 or 700' escarpement directly in its path. But knowing there's a rise there at all already gives me an idea of how, exactly, Rufford would have developed. Have very much enjoyed a proper study of your posts. A great plan and I like the way you are thinking it through. I think it is a great idea to adapt non-railway buildings built in an appropriate style. Moor Street is a great basis for a terminus. It's 1914 if I recall, but the architecture can be tweaked backwards and the plan is a sound one for a confined location. Splendidly it featured traversers. This gives you the best of both worlds in that you save on length by omitting a set of points, but also on width, as you do not need the central release road. As a station for suburban services, I think Moor Street's traverser only needed to accommodate tank engines. Whether traversers suitable for much longer express passenger engines is, perhaps, a question. That bay from GC Leicester, 2 tracks terminating in a traverser, faced by your Institute as station building, and with twin water tanks at the platform ends, would be a wonderfully compact and attractive set up. Mmm, traversers. I do like the look of those. I have, somewhere, one of those layouts for limited spaces sort of books where there's a couple of nice detailed photographs of Moor Street's arrangement, so it is certainly something to consider (also, saving the space of a couple of large radius points, means either another carriage on the maximum length of train or another 10'' or so of scenic space beyond the buffer stops). I'm sure I've seen a photo of a Hall on Moor Street's traverser, so I'm guessing it would be possible for a GC 4-6-0 or 4-4-2 to do likewise. There's a lot of information on the Moor Street traversers at warwickshirerailways.com, but the pertinent bits to take away at the moment would be the 60' length and the 170-ton load capacity. That's certainly in 4-4-2/ 4-6-0 territory. James, I have never considered the question, but if the Moor Street (or other) traversers were long enough and man enough to take a Hall or equivalent, I'd be very interested to know. It's in 'Layouts for Limited Spaces' by Nigel Adams, page 17- there's a photograph of a Hall standing on the traverser. The traverser isn't moving, so it is possible that another loco moved the stock to release the engine, but as that would foul the mainline.... in fact, the train has pulled up short of the traverser so there's room for the Hall to uncouple and draw forward fully onto it. I've been rationalising the trackplan a little. I've added a traverser to the platform roads and taken out the pointwork there. Then I've redesigned the goods yard to try to reduce the way the sidings fanned out. Then I decided to practice with a graphics tablet and suggest platforms and buildings. Big cream/orange bit is the traverser. Yellowy bit if the goods yard apron, and the grey line coming up the back is the back edge of the baseboard/ boundary of the railway property. The terracotta area is road access into the goods yard. I anticipate that the goods yard will have a fairly large impressive warehouse type building with two tracks running into it- kind of like Lincoln's Great Central warehouse (I came to know that building fairly intimately when I was a Uni student in Lincoln)- and that there will be a smaller building the other side of the road access providing goods yard offices, stable block etc etc. I've also suggested a short parcels platform/ end loading dock alongside the station. Well there's no rush or hurry with the layout; I have quite enough cluttering the workbench at the moment without adding to it (funnily enough though, despite my resolution this year to try more to clear my pile of roundtoit projects, all that seems to happen is I keep adding to it, at about the rate of two projects waiting to every one completed). I did however, a few weeks ago, get around to buying a 1:25000 (4cm to the km) scale Ordnance Survey map of the area. Now the problem with the OS maps I find is that they show everything, which is laudable, but in showing everything makes it very difficult to extract the data you want. I remember last summer I went hiking with a friend on the Shropshire/ Powys border, and we took a couple of OS maps with us so as to be able to navigate. It all worked very well- we had the vague idea of starting in Knighton and working toward Welshpool- except for the contours, which we rather overlooked in the midst of all the other information the map presented. I think we did well to keep up the bon hommie and good humour for as long as we did, but the second day... after coming down four hills, and going up another three, we rather broke at the sight of another to ascend. We tried to stick to the nice, level, smooth country lanes rather than the hillocky cross-country paths after that. 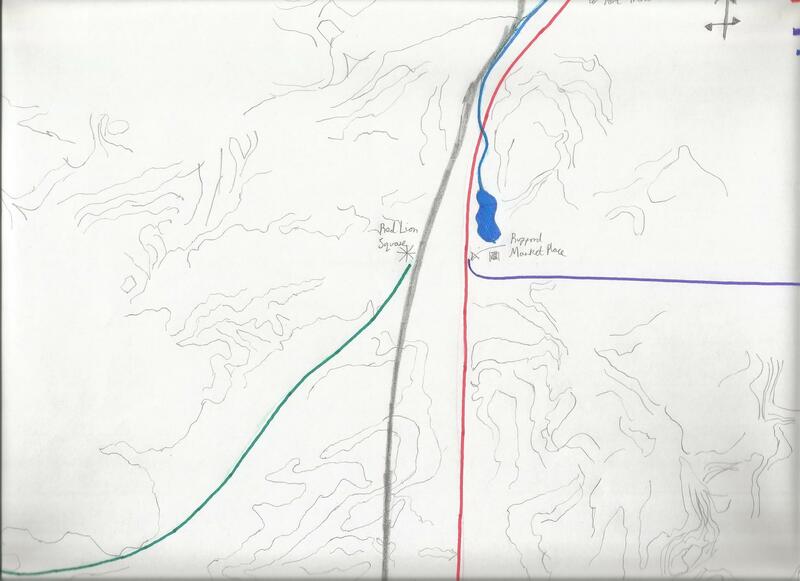 To extract the contours from the map, I traced it- at least the part that is most relevant- and then I was able to plot onto the tracing where the railway lines would most likely run. (I'll put a copy of it up later). That done,I can start a bit of town planning. Now, as I said a few days ago, I have produced a contour map of sorts by tracing over the OS map for the area. So what we have here is the result of about an hour's work or so over the weekend. So as to be able to key my tracing to the OS map, I marked on Rufford Abbey (now owned by Historic England) and Rufford Lane. I was then able to pencil in where I would run a railway, were I a railway engineer. Running north-south I've drawn in the Midand route between Nottingham and Port Trent, the location of Rufford Market Place station and the light railway to Lincoln running off to the east. This is all far, far away from the area I'll be modelling so I purposely only pencilled in a little of the contour detail. The Midand and light railway routes are really there just to give an idea. Of more interest (to me at least) is the area to the west of Rufford Lane, where my putative GC terminus would be. I've run the line to the south-west, down the shallow valley, roughly in the direction of Mansfield. Around Mansfield the line would swing round to the north-west and head up toward Beighton Junction, via Killamarsh. Now the true value of a map such as this is that I can apply my rudiments of town planning training and knowledge of how towns historically organically grew to produce a map of the town itself... this might all sound about as far removed from railway modelling as it is about to get but my goal being ultimately to produce a model of a railway running into a townscape I think that this sort of activity is an important part of the process. Very impressed. A well-conceived 'back-story' will, I'm sure, pay dividends in terms of realism and credibility later on. By the way, in the volume Edwardian Enterprise, it is stated that the Moor Street traversers were designed to take the GW's 4-6-0s. EDIT: I believe that Moor Street was completed in 1914, though that is from memory. Edwardian Enterprise states that Parliamentary powers were obtained in June 1908 and work was sufficiently advanced to allow it to open to passenger traffic on 1 July 1909. By then both the Saints and Stars were in service, though I would not necessarily have associated them with the North Warwickshire line (in which I could, of course, be entirely wrong), but it seemed the GW at least planned the station with its largest locomotives in mind. 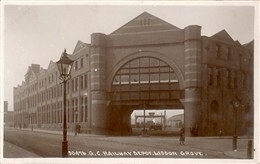 Moor Street Station became known for the use of traversers for releasing engines arriving with trains at its terminal platforms. The traversers were a form of platform with rails on to which an engine would run; it would then be moved laterally until the rails were in line with an adjoining track, along which the engine could be released. They were large enough to accommodate the largest 4-6-0 classes with tender. Edwardian Enterprise - GWR 1900-1910, Norris, Beale & Lewis, Wild Swan, 1987, page 77. So, an Edwardian precedent for traversers big and strong enough to move the largest contemporary express passenger locomotives. Thankyou; I think I'll hunt out a copy of Edwardian Enterprise too (always being on the lookout for sources of esoteric knowledge). One thing I would rather like to include somewhere on the layout would be an example of Fothergill Watson/ Watson Fothergill architecture (it would really nail down the Nottinghamshire setting, for one thing, and, well, I've always been appreciative of that particular phase of the Gothic Revival as it warped into a more Tudor/ Vernacular Revival and early Arts & Crafts style of circa the 1870s/ 80s). It would postdate the railways so there'd be at least one way of weaving it in- more likely several. It's interesting how the more I think about the sort of scene I'm trying to create, the more I'm put in mind of the Colmore Row/ Cathedral Square area of Birmingham- which is of course right alongside Snow Hill... monumental Vicwardian architecture and a (relatively) low-key trunk route station. That is stunning. Modelling that would be quite a coup. I grew up in the north of Leicestershire, near the Nottinghamshire border, and used to visit Nottingham quite frequently. It is a great part of the world, yet not so well known or represented as it deserves. I am all for choosing civic and town architecture that would give a strong sense of Nottinghamshire. Nottingham Victoria, and the way the GC line bored and cut through the city-scape looked very impressive. Anyhow, this enforced hiatus does have it's advantages, allowing me to continue with research. This sketch map, for instance, which I found on the 'rail chronology' website. Which is very useful in showing the general layout of the Mid-Nottinghamshire coalfield in the area around my putative Rufford. As best as I can tell from my Ordnance Survey map, Rufford (as I plan it) lies almost due south of Ollerton and to the northeast of Mansfield Woodhouse and Clipstone. Now this sketch map above demonstrates that were that the case the town would be sitting roughly in the middle of a horseshoe crescent formed by the collieries. Which is rather handy, as it means I have less in the way of warping the local geography to justify. Head of manor: Rufford I. Other resources: Meadow 20 acres. Woodland 1.5 * 1 leagues. Considering how small the village was, it is no wonder the Church was able to march in and tell the locals to leave in the mid-1100s. But what sort of arrangement would that village have had? You've got 10 households, 4 plough lands and 4 plough teams. This would plainly be long before the farm as we understand it today came into being (arguably with the Enclosures Acts of the mid-18th Century onward), so by 'plough lands' I feel it is reasonable to make the assumption that areas of ridge and furrow farming are being referred to. Indeed, large tracts of it survive today- especially in the East Midlands- what was it John Betjeman wrote of the Great Central Mainline and running through ridge and furrow in one of his poems? It would be nice to muse along those lines but of course I'm steadily drifting away from divining the layout of Rufford circa 1100. W.G. Hoskins, in his book "The Making of the English Landscape", describes how there are three basic types into which almost all villages fall- those arranged around a central square or green, those strung along a street, and those which are haphazard, with no discernable nucleus. The question now becomes which of those three types Rufford is likely to have fallen into. Now if you look at my traced map in a previous post you will notice a thick pencil line running north-south, which is today's "Rufford Lane". It would be tempting therefore to say that the village described in the Domesday Book would have been of the street type, but to refer to Hoskins again.... "A great number of new by-roads came into being as a result of the Enclosure movement [Mid-1700s onward]. They are immediately recogniseable on the one-inch map by the manner in which they run from village to village practically straight across country....More significantly still,these straight roads sometimes do not run to the nearest village but run for some miles through open country". No, I think today's Rufford Lane is most likely an example of an 18th Century road. More likely perhaps is that Rufford would have been of the central square type, which was prevalent through the lower half of Eastern England. Rufford, in real life, never progressed beyond this status, as the Church established an Abbey in the neighbourhood and evicted the village in the mid-12th Century. But what if that hadn't happened? Let's say the Abbey was founded, but the village given a stay of exection. Perhaps the Abbey grows; perhaps Rufford takes on the air of a Medieval estate village. Perhaps the village is hamstrung in development by the Abbey- "We will tolerate you, but that is all". But that begins to change in the 1540s, with the Dissolution of the Monasteries. In real life this definitely affected Rufford Abbey!- it was seized and then sold off to become a country house, and 350 years after the dissolution of the monasteries its owners were amongst the principal backers of the Lancashire, Derbyshire & East Coast Railway- but with regard to that last point we are getting ahead of ourselves. Thus Rufford becomes a proto-industrial settlement with iron being quarried and smelted. It would start to develop beyond being arranged around a village square, maybe the river on my traced map is canalised to transport the iron to the Humber, maybe tracks to surrounding villages are formalised and become roads and then extended further, to Nottingham and Sheffield. And so it might naturally, slowly, grow through the 17th Century and into the early 18th. With the Enclosures Act it might not be unreasonable to say that the lands around the town are enclosed, which is to say they are transferred from being common land available for the use of all, to private land which might be bought and sold. Which thereby allows the iron quarrying activity to step up a notch- the quarries can buy vast tracts of land for quarrying. Coal becomes a useable resource and mines are opened- around 100/ 120 years before they were in real life. Some people in the town start to become wealthy- whilst the population of the town explodes. Historically you tend to find that the urban wealthy preferred to live at some remove from the source of their wealth. That is to say that a coal owner would, generally, prefer not to live in a house giving a view of his mines. There are exceptions of course- the Darbys of Coalbrookdale for instance, and the Wedgewoods of Stoke- but they are the exception, not the norm. You also tend to find that the urban wealthy objected to being obliged to interact with the urban poor. If you look at industrial towns of the 18th and 19th centuries, what you might see is a suggestion of phased urban growth as a series of alternating bands. You would have, at the outset, the source of wealth. This might be a mine or a factory. Outside of that, you would have an area of housing for the workers. Outside of the worker's housing, a smaller area of housing for the wealthy. Eventually the room for the workers housing becomes fully used, so any new housing for that population is built outside of the housing for the mine and factory owners. Who object to their neighboorhoods being a throughfare. So they move themselves outside of the new workers housing area. This might happen two or three times, which is why in urban centres you might even today find fine examples of upper-class Georgian architecture in the middle of inner-city 'grot'. See Birmingham's Jewellery Quarter for an example. How does this relate to Rufford? See my map above showing the location of the coalmines in the area. Also my comment of how Rufford will sit roughly in the middle of the horseshoe shape formed by them. The horseshoeshape of the mines- bands of workers housing from those mines working inward toward Rufford. Inside of those bands, another, smaller area of housing for white-collar workers, the mine and quarry owners, so on and so forth. Maybe this doesn't form a full band- in fact I doubt it would- but then inside of that is the town centre itself. The part of the town closer to the higher-class housing of course being the more salubrious part, and then areas of steadily declining status until the town centre meets the workers housing. I'd do well I think to draw up a sketch map illustrating this. The next step then is to decide exactly where in that town centre I'm going to place Red Lion Square station, and indeed Red Lion Square itself!- and then I can make some decisions as to the functions of buildings in that square and the form they should take. Planning quite literally from before time immemorial. I like the idea of establishing what sort of place Rufford was pre-railway. Once connected, we can expect rapid expansion, but the appearance and arrangement of the nucleus of the town will have been determined by its previous history. Did it have a market? Borough status and burgage plots, for example? There must be other Notts coalfield towns and villages that could provide precedents, showing what they were both before and after the railway connected town and pit.